Spring is here, and that means Spring Training is coming to an end for the big league ball clubs. Rosters are being trimmed, warm-ups and fine-tuning are winding down, and soon the money and the dreams will be placed on the table of a new season. 162 games, a grueling season of 13150 innings (give or take a dozen or so), 25000 pitches, and that doesn't count post-season (or pre-season for that matter). Every year, I get a little twinge of curiosity and excitement about the upcoming season, a hold-over I suspect from my childhood, when the Spring semester of the school year began to wind down, and the open spaces and possibilities of Summer appeared on the horizon. Just as vacation time came around, the boys in white cotton were starting the long grind of the Summer Game. As a boy, I played in organized ball between the ages of 7 and 14, stopping after my sophomore year in high school, diverted by the more enthralling demands of philosophy, literature and music. My interest in sports would, over the next couple of decades, take a backseat to an academic adventure, steady work, and forays into serious writing, music and marriage and father hood. I briefly followed the Oakland Athletics and Golden State Warriors during the 1970's, but otherwise had little interest in pro-sports. By the time the new Giants stadium at China Basin opened in 2000, Barry Bonds had been installed as the team hero, and its prospects had begun to brighten. Still, it would be another decade before the Giants would win the first of their three championships since moving to San Francisco from New York (2010, 2012 and 2014); and by that time, Bonds was gone, chased out by allegations, and legal troubles involving illegal drug use (steroids). The team's run over the last six years has been phenomenal with a combined record of 608-526 over that span. Each year at this time, teams begin to size up their chances and imagine how they may fare against their immediate opponents in their own division, as well as against the rest of the teams they will face during the season. Competition is expressed as a wager of odds, and in pro baseball, much of it's about statistics, since the sport is, if nothing else, almost overburdened by statistical data. Everything that can be measured is measured, and cross-referenced, and tallied and converted into algebraic formulae--all for the simple pleasure of estimating the relative values of individual players, on-field strategies, and the merits of the respective teams. I've never been much interested in statistics, but it is fun to speculate about what the Giants might do this year, their "on-year" in the pattern of alternate year championships over the last six campaigns. Every year, teams look a little different than the last. Players retire, or are traded, or sign as free agents with other clubs, or are demoted back to the minor leagues. Sometimes, players change positions. Starters go to the bullpen, an infielder moves from short to third, a catcher moves to first base; and in the American League, a position player takes on the Designated Hitter spot in the line-up. Players get older, younger ones arrive, and the complexion of the team changes, sometimes a lot. That illusive quality, "team chemistry" changes too, as the focal point of the team's sentiment shifts to accommodate the inspiring leaders from year to year. This year, there are few changes to note, and some of those were expected. Timmy Lincecum, the team's former phenomenal Cy Young winner in 2008 and 2009, ran his string out, as his contract ended, and his declining fortunes (and failing health) resulted in his being (at least at present) without a contract. It will be strange not thinking of Timmy on the team this year; but his small body and jerky-jerky wind-up finally wore him out, and it may be ultimately the end for him. We've said goodbye to Ryan Vogelsong, a journeyman who came back from Japan after 4 years, and helped the team as a fifth starter for five good years. He has a one year deal with the Pirates. Tim Hudson retired, as expected. We liked his experience and dedication, but he had become only a shadow of his former dominant self, and winning a World Series in 2014 made it all worthwhile for him. Happy Trails, Tim. Jeremy Affeldt, he of the "scud"-pitch, also chose to call it quits. I was never much impressed with his side-winding delivery style, and uneven performances, so I'm not too worried about losing him. Yasmeiro Petit, our resident major-domo of the staff, was signed by the Washington Nationals. Good luck to him, too. He may be missed. Mike Leake, whom the Giants had considered as one of its regular starters, went to St. Louis for pretty impressive money (six years at 93 million, five years guaranteed!). I'm not sure we would ever have paid him that much, based on how he performed for the partial season last year. The stylish lead-off hitter Nori Aoki wasn't offered a contract by the Giants after his one free-agent stint in left field--which rather surprised me--and he signed with the Mariners for two years. That left us with a hole in the line-up, which was quickly filled. With respect to acquisitions, the Giants signed Johnny Cueto, the durable starter formerly of the Cincinnati Reds (102-70 in 8 years in the majors)--with the Luis Tiant-wind-up, the long dreadlocks, and the quirky character. We signed him for 7 years, so we can only hope that his future is rosier for us than Barry Zito's was. In addition, the team signed another relatively high-profile free agent, Jeff Samardzija. Despite his mediocre won-lost percentage, Samaradzija's strike-out numbers suggest that 2015 was an anomaly. Still, he's one of those journeyman who could have two or three really good years, and he could eat up lots of innings, if he can keep hitters from hurting him with the long ball. With Aoki's departure, and Pagan's decline, the team signed Denard Span for four years. Span is a speedster who steals bases, can turn doubles into triples (a big plus at China Basin), and he scores runs. The hope is that his off year in 2015 was just that. The team desperately needs speed. Returning from injury years are Joe Panik, Pagan, Cain, Belt and Pence. (Parenthetically, it's fun to imagine how much better the team would have performed in 2015, if those injuries hadn't occurred.) Panik, Pence and Belt are all in their prime, and given an injury-free year, they could all play at a superior level. At third, Matt Duffy quickly made fans forget roly-poly Pablo Sandoval, who now suffers from the exaggerated expectations of Red Sox fans. In the outfield, Pagan will share time with Span, and Gregor Blanco (who had a career year last year as the roving outfielder sub). 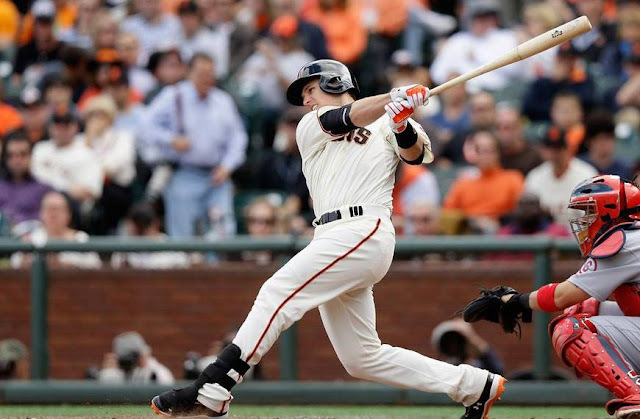 At catcher, we have the reliable anchor Buster Posey, whose Hall of Fame career is unfolding as expected. So here's a wild stab at our opening day line-up, insofar as I can deduce it from the team's announcements. The list of starters seems right now to be Bumgarner, Cueto, Samardzija, Peavy, Cain and Heston. That's six, but things haven't really clarified given the performance of this group during Spring training. No one--not a single member of this group--has shown any consistency at all, giving up lots of hits and runs. Out of the bullpen, we still have Santiago Casilla, Sergio Romo, Hunter Strickland--any one of whom could end up being the putative closer--with Javier Lopez and George Kontos as set-up men. There are the usual group of utility players and spot pitchers: Tomlinson and Adrianza on the infield, Osich and ??? in the bullpen? Given pre-season expectations, and the improvements to the other teams in the division, I wouldn't expect the Giants to do as well as they'd like, unless the starting pitching does better than expected. I have sincere doubts about the abilities of Peavy and Cain to pull their weight. And if Samardzija and Cueto have mediocre years, things could get very dicey by mid-season. The offense looks good, if Span and Panik and Pence can hit over .260. And if Belt and Posey and Crawford could each hit 20 homers or more, things could be exciting. But Posey is still the only true star player in this group. For a team to succeed, most of the players have to play up to their potential, and though there's a lot of potential here, there's also a big possible downside. 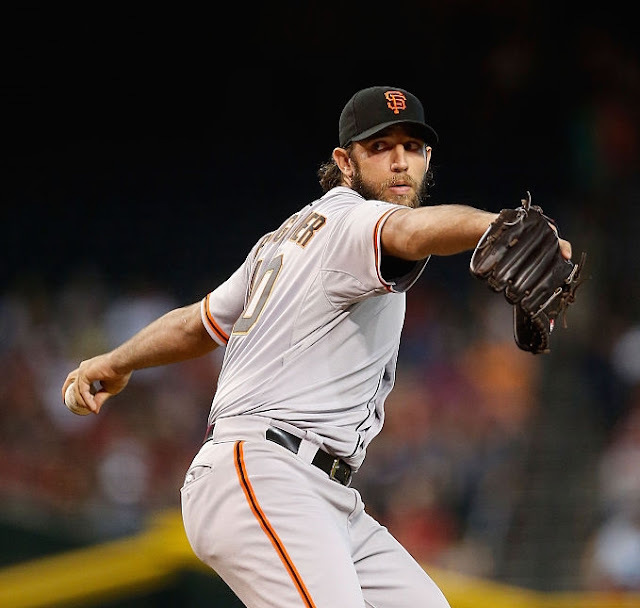 Expect Bumgarner to win 18 games, but beyond that, no one is a sure thing. Expect Posey to hit .300. Expect Casilla and Romo and Strickland to get 35 saves between them. Hope for a team batting average of .275, a team ERA of 3.40, pray for 200 homers. Anything can happen. There are really way too many question-marks about this squad, too many to fuel much optimism. I expect the Giants to fight for second in their division. Arizona looks much better this year, the Dodgers about the same. My expectations are muted, but I'll be rooting for'em nonetheless. During the Romantic Era in classical music, roughly from 1800 to 1850 (though it continued to be expressed for decades after that), serious European composers enjoyed displaying their prowess in composing sets of pieces on a short lyric formula. 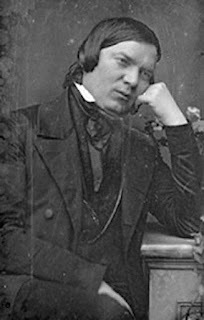 Many of these composers were highly skilled at the keyboard, and during the Romantic period, one of the chief social events was giving an intimate performance to select audiences, during which young impressionable ladies in the audience, overcome by the exalted power of the musical "genius," would swoon in thrall to the outpouring of emotion communicated through the music. This swooning was the metaphorical evidence of the capacity of art to move human emotion, especially love, longing, despair, regret, loss, and intense joy. Young ladies were imagined to be particularly susceptible to such extremes of emotion, perhaps as a consequence of their inherent "weakness" or vulnerability. So much for sexual freedom! Robert Schumann [1810-56] composed the suite Carnival [1834-5, subtitled Little Scenes on Four Notes, consisting of 21 ordered pieces], inspired by his love for his then fiancé, Ernestine von Fricken. The four notes are codes--for the town where Ernestine was born, the word for carnival in German, the word for Ash Wednesday, and finally for Schumann's own name. The idea of composing a set of variations was by no means a new concept by this time, but the idea of stretching the range of musical styles and extremes was a hallmark of romantic expression, like performing a feat of protean transformations. The tradition of the young precocious virtuoso performing magic and majestical feats at the keyboard is alive and well in our own time, and young Evgeny Kissin's performance of the Carnival is a prime example of the trope. The brevity of each piece in the suite belies the seriousness of the musical ideas employed. It's rather like seeing a dancer do 20 different kinds of steps. Sort of a "look, ma, no hands" affair as the audience gapes with astonishment at each masterful incarnation. Schulman's not beyond making fun of some of the styles; in one, he even parodies his contemporary Chopin, though the sound is so beautiful, you wonder how Frederic wouldn't have appreciated the gesture. Too, there's something of the alchemical about using a coded formula as inspiration for an emotional statement. Part divine formula, part secret reference. It places the composer in the position of interpreter of the oracle, receiving inspiration from a set of keys to which only he has access, by virtue of his genius--a very romantic idea. Music is by its nature rhythmic, and harmonic, but the idea of extending a piece of music beyond the initial rhythmic scheme that defines a work, to longer forms (such as a symphony) didn't really take hold until the beginning of the Romantic period. You can see the difference by comparing an early symphony of Mozart's, to a late one by Beethoven. For the Romantics, a musical idea could be extended into a kind of journey, which might include a number of different tempi, instrumental choices, changing moods etc. This quality of journey led to a greater level of abstraction, which is evident in Beethoven, and also in Brahms. But the interest in suites of shorter pieces, as expressions of the progression of a ideas which cohere around a specific theme or inspiration, is also a strong aspect of the Romantic tendency. The individual pieces are linked into a sequence of versions of the initial theme, which may be concealed beneath improbable inventions, only to re-emerge, slightly altered, in a later part. As the sequence proceeds, the gathering emotional inertia may lead inevitably to a thematic crescendo, summarizing the triumphant fulfillment of the whole. And the variety of kinds of musical styles or types, keeps the listener alert, and refreshed. Unlike in a Romantic symphony, where the musical ideas may get bogged down in long meditations, a suite of variations may create the same sense of satisfaction and pleasure while not demanding the same level of continuous mental concentration. Johannes Brahms was a composer I had to grow to love over time. His thick, lush harmonies, and very dense compositional style always put me off as a student of the keyboard, and his passionate sternness didn't appeal to me in my youth. It was years before I heard his Hungarian Rhapsodies, some of which are as light-hearted and playful as anything in the classical canon. I think I first heard his Variations and Fugue on a Them by Handel* about 30 years ago, in a recording by the late, great tragic pianist Julius Katchen, who died at the age of 42 of cancer. The Handel Variations begin unobtrusively with the simplest quotation from the theme, then proceed through 25 variations, ending in a brilliant fugue. The suite moves easily through varying moods and styles, though the level of skill required to perform it are considerable, taxing the ability of any serious player. 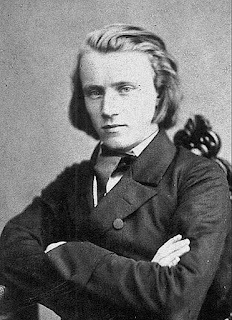 Brahms is less playful and tongue-in-cheek than Schumann is in Carnival, but the range of emotional moods is just as various. What is the literary counterpart of a variations on a theme in music? Perhaps a series of sonnets, like Shakespeare's. Perhaps a sequence such as Berryman's Dream Songs. Or Berrigan's Sonnets. Or Spicer's The Holy Grail. Or Creeley's Numbers. There's something show-off-y about running a series of changes in a strict form, without losing inspiration or interest. It's somehow a proof of artistic genius, to exploit a form just for the sake of doing it. I've essayed the form in my poems "The Boat" and "Poem in Twenty Sections" though I'm not very certain of the ultimate value of doing it. The notion of the demonstration of craft is more important to traditionally-minded artists or craftsmen than those of us who like to explore free-form composition. I would never say that doing so is either easier or less fulfilling than inventing a new form, though. In music, maintaining a thematic core is a demanding requirement just as it is in language, requiring both flexibility and facility. Which is more difficult, to write a sonnet sequence or a theme and variations for the keyboard? *Played here by Murray Perahia, a brilliant performer. The apéritif is typically a drink served before a meal, ostensibly to aid in digestion, though to what extent this is really the case is dubious at best. Any handy excuse invented for the imbibing of alcoholic beverages must be viewed with a skeptical eye. But no excuse is really needed to appreciate a good concoction; it's a pleasure in itself, not in need of any artificial encouragements or pretexts. Here's one that I thought of. The imagination plays a big part in the invention of any kind of taste. The greater your familiarity with how flavors are experienced, the greater the possibility that you may divine the right consummation of spice and mouthfeel. Curiosity also plays a part. Sweet vermouth is commonly drunk all by itself as an apéritif, but as a basis for mixing, it has just as much possibility as ordinary spirit goods (like bourbon or scotch). 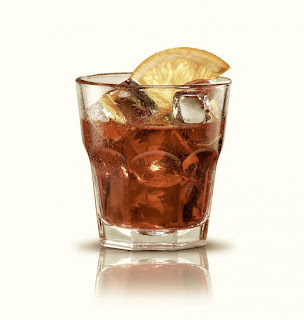 And its inferior strength means it should carry less of a kick, and hence fulfill the notion of apéritif, instead of a regular cocktail. This one won't chase the ladies away, either, which is always a consideration. Then there was the story of the guy who had been a speed-freak, who told me that he’d go into these obsessive quests in the city, diving into dumpsters, frantically driven by the intense intuition that he would find, at the bottom of one, under the layers of garbage and discarded detritus, priceless diamonds. The certainty with which he believed this, when in this extreme state of excess fatigue, was such that nothing could deter him, he’d spend days and nights walking through alleys in the city, climbing into huge dumpsters that sat behind apartment buildings or factories. During these seizures of obsession, he’d neglect to eat, or care for his hygiene, and would become black with the accumulated filth of the garbage, like a chimney sweep, but it didn’t matter. His lust for treasure was overpowering. He also related that when in such feverish highs of speed, he would go into bookstores and voraciously devour whole texts at breakneck speed; he claimed he’d read all of Gray’s Anatomy in a single sitting, though this may have been drug-induced delusion. One guy told me he’d been working as a plastics engineer in Detroit when he developed marital problems. Following his divorce, he'd decided to take some time off, and flew out to San Francisco for the beginning of a vacation. He was walking across Market Street in broad daylight when he was blind-sided by a taxi, and nearly killed. He was unconscious—in a coma—for a month, and there was some doubt that he’d even live. He’d been a very fit man, a weight-lifter before the accident. When he finally recovered, he’d been missed back at his old job with General Motors, and was presumed disappeared or dead. After 5 months in the hospital, he was a shadow of his former self, and he decided to stay in San Francisco for a while. Work was hard to come by, he was on general assistance. He took any kind of part-time work he could find. He was hired by the owner of an old apartment building in the city to sit in a dark basement and shoot rats. After a while, he developed some mysterious infections, which the doctors couldn’t diagnose. It turned out that while he’d been in the hospital, he’d been given blood transfusions, and he’d gotten the AIDS virus. This was in the early days of the disease, and he tried various kinds of medicines, none of which quite worked. But he persevered, and managed to stay alive. He’d also been a serious amateur jazz pianist, an interest we shared. He greatly admired Errol Garner, whom he said he heard play several times. 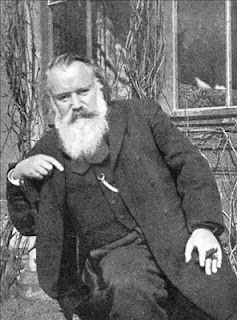 He was astonished at how fast and accurately Garner could play octave trills and leaps—one of the hardest feats at the keyboard. He even got a few gigs himself in some dive in the city. He’d been a polymer physics researcher at GM. He was philosophical about his plight, accepting the hand fate had dealt him. He wondered what might have happened to him, if his wife hadn’t decided to divorce him. I lost track of him back in the ‘90’s, but always remember how strange and mysterious his life had been. His life was like an O Henry story. There's a famous piano piece, by Debussy, titled Feux d'Artifice (or "fireworks"). There's a nice rendition of it here on YouTube, performed by Marc-André Hamelin. It's vintage Debussy, filled with murmuring vibrations and poly-tonal runs and trills. Mists and vague intuitions float over distant visions and shimmering images. It's from the composer's Preludes Book II. In some ways, music--classical music--was never the same after Debussy, and in the same way we haven't "gotten beyond" the kinds of effects and emotions he was able to evoke through his work. Usually, Impressionism in music lends itself best to water effects or metaphors, and there are plenty of those in Debussy's work. He wrote a huge three-paneled work entitled simply La Mer, in which the whole classical orchestra works to create varied impressions of the sea. 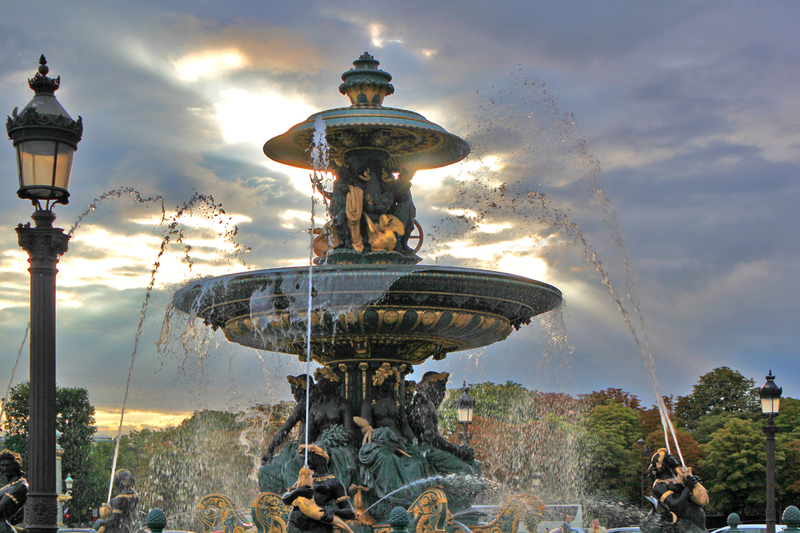 Fountains are very big in Europe. Sometimes, though, one is not sure whether a Debussy piece is about water, or fire. Feux d'Artifice could be about walking along a dashing mountain stream, as much as about watching a big fireworks display in the night sky. Such interpretive vagaries belong to the ambiguity of our impressions, how certain sounds are perceived by the individual listener, and what they may suggest, given our imaginations and unique experiences. Pure music as opposed to "programmatic" music--it's supposed to be a distinction with meaning, but such definitions are never clear cut in art. In any event, here's a new light cocktail mix, which celebrates the light-hearted spirit of French Impressionism. The recipe is for two servings. These are mixed together with crushed ice, and then poured into chilled cocktail glasses, to which is added enough bottled Pellegrino water to bring them up to full. Its effect is similar to a champagne cocktail, but you don't have to open a bottle of champagne to make this one. Champagne cocktails are a problem because it's hard to justify killing a whole bottle of the stuff just to make a couple of drinks. If you don't drink it right away, it goes flat, and there's nothing less enticing than champagne that's gone flat! This mix solves that problem. Spring is coming! [March 19th] So pack away your troubles and indulge in these foolish things!